Buck et al. have discovered that women trying to conceive take longer to become pregnant if they have a history of consuming PCB -contaminated fish caught in Lake Ontario. 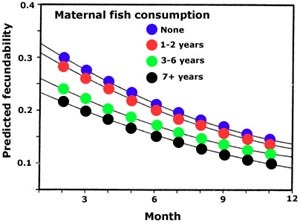 The graph to the right indicates that the longer the history of fish consumption by potential mothers, the less likely is a conception in any given month of trying to conceive. Each curve describes the likelihood of conception for women who have different patterns of fish consumption. A lower curve means a lower likelihood of conception. adapted from Buck et al. 2000. The likelihood of conception also decreases as time (in months) goes on, for women who have failed to conceive up to a given month. This is likely to be a statistical result of the fact that as time goes on, women who can conceive do and the pool of potential mothers is increasingly dominated by women with fertility impairments. Buck et al. interviewed women in a study cohort of anglers and partners of anglers (the New York State Angler Cohort Study), ascertaining time to pregnancy (TTP) for the most recent pregnancy. They restricted the sample to the women who reported having stopped use of birth control and for whom information was also available, for the women and their partners, about fish consumption. In the interview, Buck et al. also gathered information about smoking, prior experience with infertility, or other relevant gynecologic problems and treated these as potentially confounding variables in their statistical analysis. Approximately 28% of the sample reported conception during the first menstrual cycle of trying to become pregnant. 81% reported requiring 6 or fewer months to conceive, whereas 9% required 13+ months. The length of time that mothers had eaten Great Lakes fish prior to attempting to conceive was associated with an increased latency to pregnancy. In everyday terms (which the article studiously avoids), the longer mothers had been eating Great Lakes fish, or the more they had eaten, the less likely it was that they would become pregnant during a given menstrual cycle. They found no comparable pattern for the father's fish consumption. Buck et al. caution that their study, while highly suggestive, "should be considered preliminary" because the data on time to pregnancy and fish consumption were from retrospective interviews and thus subject to recall error, and because their data on potential confounding variables was limited. They also note that while fish consumption was associated with longer time to pregnancy, all the women in the study eventually became pregnant. Their sampling procedure may unintentionally have excluded completely infertile couples. Hence the population consequences are unclear. Their study does reveal one unambiguous fact: that despite years of public education efforts to discourage people from eating contaminated fish, people continue to do so, including women of child-bearing age. "Among the angler couples in this study who were attempting pregnancy, 42% of women and 68% of men of reproductive age reported ever having eaten Lake Ontario fish despite state advisories warning women of reproductive age not to eat any fish from Lake Ontario... fish consumption advisories for Lake Ontario have been issued in New York State since 1976" yet "only 49.9% of Great Lakes sport fish consumers were aware of health advisories."